Then, there are all the variety of latkes with chefs, cooks and food bloggers trying to out-creative and out-clever one another: Sweet Potato Latkes, Zucchini Latkes, Cilantro Jalapeño Latkes, Spaghetti Squash Latkes, Spinach-Feta Latkes and on and on. I’ve even made Salmon Potato Latkes, Bacon Potato Latkes and Mushroom Latkes, so I’m clearly not a purist. However, there’s nothing like a well made, straight up potato latke, hot from the fat, smothered in sour cream and slathered with chutney, like my new Ginger Bred chutney I made for Christmas gifts. The battles are entertaining to watch, but as I do, I find myself becoming hungry and jealous. Hungry for latkes and jealous that my Jewish roots are very thin, so my family doesn’t celebrate Hannukah and get to eat a lotta latkes. When my mom was little her roots were confusing. Her mom was born Catholic and converted to Judaism. Her father was a Russian Jew, but he’d lost his faith in God because his family was exterminated by Stalin. Not sure if they had latkes for the holiday when she was little, but I decided to I needed to make some to assuage the growling in my stomach. I didn’t have an official recipe of my own. I’d just make them with no real recipes. I took advantage of the latke battles of 2014 and conferred with various “How To Make The Perfect Latke” articles including the well researched The Complete, No-Nonsense, Slightly Neurotic Guide to Making Great Latkes by Max Falkowitz, the Splendid Table’s Perfect Potato Latke (which comes up first on Google when you search for “How To Make The Perfect Latke” ) and my friend and Latke Queen, Dori Fern’s article and recipe, Latke Love: One New Yorker’s Triumphant Quest for the Perfect Potato Pancake. She frys her latkes in duck fat! Just the thought makes my mouth perspire. 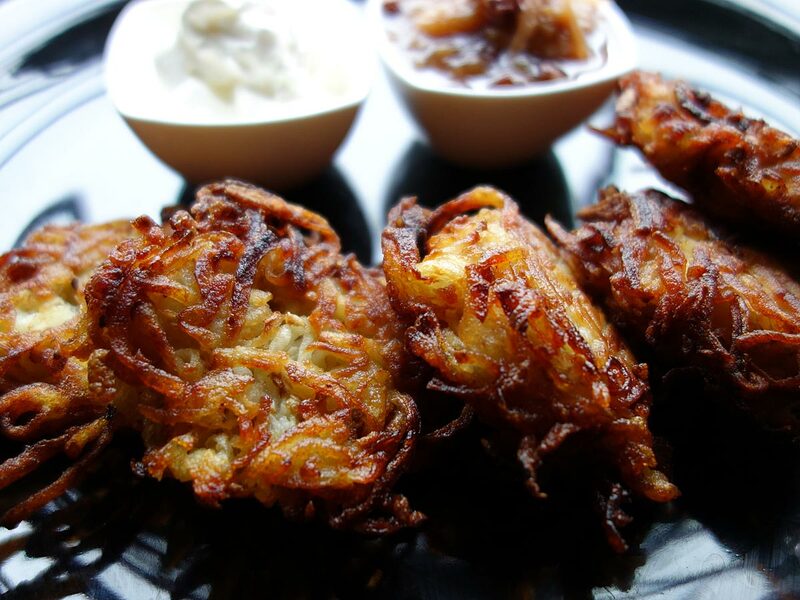 Dori makes a gazillion latkes every season for charity. This past holiday, she turned thirty pounds of potatoes into duck fat fried latkes for over sixty five folks. I read them all and read a few more, to come up with Jackie’s “Perfect” Latke recipe. I agreed and disagreed. I tweaked and taste. These are damn good! Will I be pitting mine against anyone else’s for the title? No way. They never last that long.